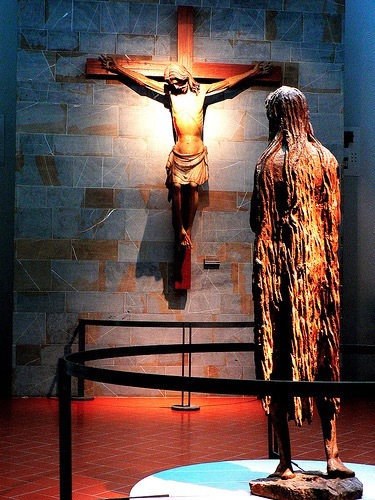 Donatello’s 15th-century statue of Mary Magdalene commands attention. The ravaged figure, with her gaunt features and imposing size of near two meters, is at once enthralling and repulsive. She is a Magdalene different from those most typically encountered in art history. In fact we may not immediately recognize Donatello’s Magdalene, as she does not bear her traditional iconography of either alabaster jar or memento mori (a skull serving as a reminder of death and impetus for repentance). A closer study, however, reveals her identity. In later hagiographical history, Mary Magdalene—the paragon of penitence—is unsurprisingly conflated with St Mary of Egypt, a woman who renounced her life of prostitution and lived an ascetic life in the deserts of Egypt, only clothed by her long hair. This Mary is the source of inspiration for Donatello’s work. She is not the beaming and beautiful (even sensual) Magdalene of Titian, nor that of Caravaggio or Antonio Canova. This is a Magdalene physically scarred by her past life and present penance. Her emaciated figure, with sunken eyes and protruding collar and cheekbones, communicates extreme and frequent fasting. Her skin is weathered by the sun, her hair thick and matted. This Magdalene jars her viewers. But dejection and sorrow is not all we sense in Donatello’s figure. Though the statue is now the brown of its poplar wood, restorative efforts revealed that the statue was originally poly-chromed and Magdalene’s hair gilded. This would have not only given the effect of natural highlighting from her years in the desert, but also would have underscored her holiness. We, however, do not completely lose sight of this effect without the gilding. Mary’s eyes stare onward focused on something beyond, something transcendent. Though we sense that she is waiting and yearning, she is also—as the slight contrapposto of her stance suggests—moving. Donatello’s Magdalene perseveres. And it is this figure, one of many which adorned the Florence Baptistery, that catechumens laid eyes upon at the event of their baptism—a physical reminder of the present reality of being made new as well as the eager anticipation of the redemption of our bodies. This expectation is strikingly conveyed in the positioning of Mary’s hands. Raised before her in a gesture of supplication, the fingers draw near each other but do not yet touch. While the Magdalene’s original setting is unknown, records indicate that she stood in the Baptistery by 1510. There she remained until 1966 when the Arno flood severely damaged the statue, causing its permanent relocation to the Museo dell’Opera del Duomo. Though deprived of her longtime religious setting, the museum has done an excellent job of thoughtfully positioning Mary. Well known as one of the women at Christ’s crucifixion (Mt 27, Mk 15, Jn 19, and arguably Lk 23), Donatello’s life-size Magdalene has been placed before a life-size crucifix. She ever looks to Christ, upon whom her gaze now seems affixed, the author and perfecter of her faith. Donatello: Penitent Magdalene, 1454-5, poplar wood, poly-chromed and gilded, 188 cm. Museo dell’Opera del Duomo, Florence, Italy. Donato di Niccolò di Betto Bardi (c. 1386 – 1466), better known as Donatello, was an important early Renaissance sculptor from Florence. He studied classical sculpture and used this to develop a fully Renaissance style, which his periods in Rome, Padua and Siena introduced to other parts of Italy over his long and productive career. He worked in stone, bronze, wood, clay, stucco and wax. Though his most famous works are statues in the round, he also developed a new, shallow type of bas-relief for small works. A good deal of his output consisted, moreover, of larger architectural reliefs. Kevin Burns recently completed his master’s degree at the Institute for Theology, Imagination and the Arts at the University of St Andrews, Scotland.